Successfully Establishing A Single Unified Brand Following Seven Global Acquisitions. AMRI is a global contract research and manufacturing organization that provides discovery, development and manufacturing services to clients in the pharma and biotech industries. After acquiring seven global entities across North America and Europe within three years, AMRI needed to bring these businesses together through a solidified strategy and cohesive brand and message. Ready to rely on SCORR for its established expertise in industry mergers and acquisitions, AMRI engaged SCORR for strategic guidance and creative execution of a new unified brand. Prior to partnering with SCORR, AMRI’s legacy businesses had functioned as separate brands with their own missions, messaging and marketing collateral. These businesses did not position AMRI’s full suite of offerings consistently. Furthermore, brand confusion made it difficult to garner company buy-in. AMRI needed to create a brand identity that differentiated it from its competition, and assure employees, clients and potential clients of the continuity and stability of the company. SCORR guided AMRI with its strategic SCORR CORE process. First, SCORR conducted internal and external assessments of AMRI and its individual legacy companies’ brand perceptions. This included an assessment of customer insights, a competitor analysis and an evaluation of market trends. One particularly important finding from the external perception surveys indicated that the overarching AMRI brand garnered higher awareness than individual legacy companies. This meant that acquired entities would not lose brand equity by integrating into the overall AMRI brand. Furthermore, the assessment identified brand confusion regarding what services and capabilities AMRI offered. AMRI engaged with SCORR under its FSP relationship model, where SCORR serves as a full-service, dedicated program management and marketing team, reporting directly to senior leadership at AMRI and executing an integrated approach to the brand strategy. By featuring thought leaders from AMRI, SCORR showcased each service line with an identity that tied to the larger brand. The Big Idea encapsulated AMRI’s credibility in the industry and promoted perceptions of stability while also conveying a personalized touch with which respective audiences could engage. 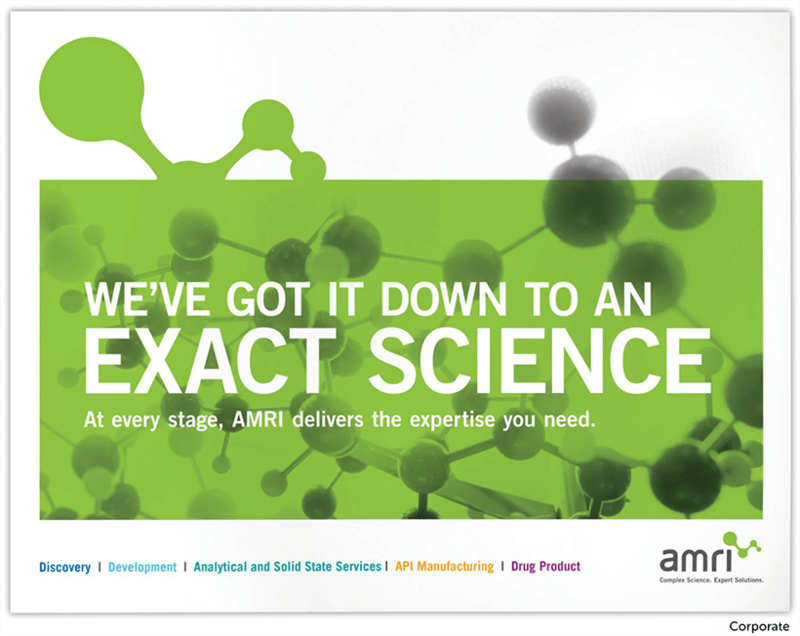 In 2007, prior to engaging SCORR, AMRI had changed its name from Albany Molecular Research, Inc., to reflect its evolution into a global contract services and R&D organization. However, the company did not always apply its new name. SCORR consistently used the new AMRI name in all messaging to establish the company as a global brand with worldwide facilities and customers. This change was made in all internal and external communications to ensure cohesive brand messaging. In May 2017, SCORR launched the new AMRI brand at InformEx/CPhI North America. 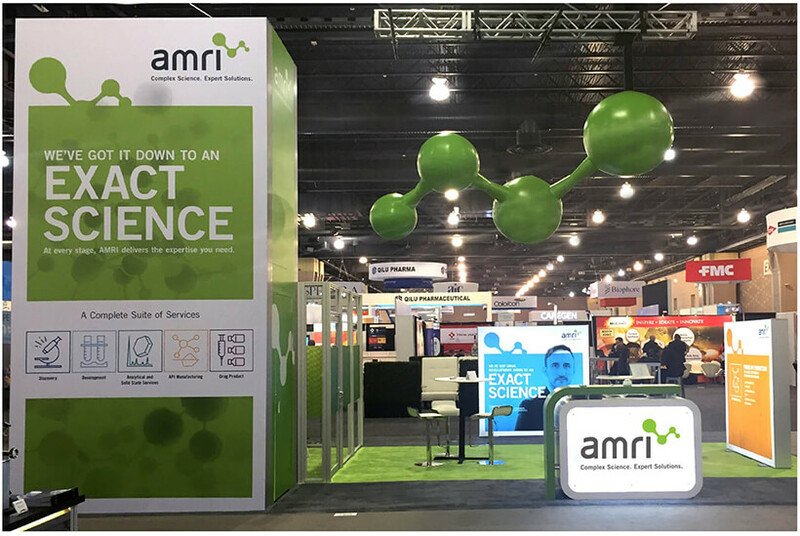 The launch included a large custom island booth with a giant, floating inflatable molecule similar to the molecule featured in the new AMRI logo, and signage was placed throughout the exhibit hall. To generate excitement about AMRI before the show, SCORR created a teaser campaign that included print and digital media placements. Additionally, a drip email campaign, social media posts and a video directed clients and potential clients to a custom landing page that continuously updated, gradually revealing more of the new identity as the launch approached. Through the FSP relationship, SCORR worked with AMRI’s internal marketing resources as a unified team to develop and execute the brand launch plan. After honing the core messaging, SCORR presented the new branding elements at an AMRI internal town hall meeting. AMRI achieved its goal of garnering internal buy-in from its legacy companies. 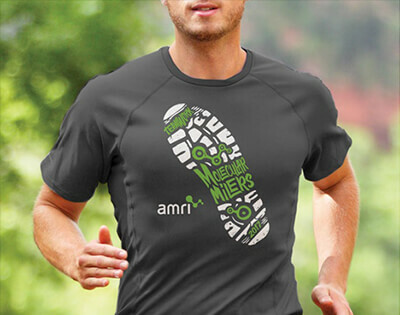 Employees became brand advocates, which included participation in community events as part of an AMRI team (such as running local races as the Molecular Milers) and social sharing via their personal social media accounts. They also took pride in their rebranded trade show presence. 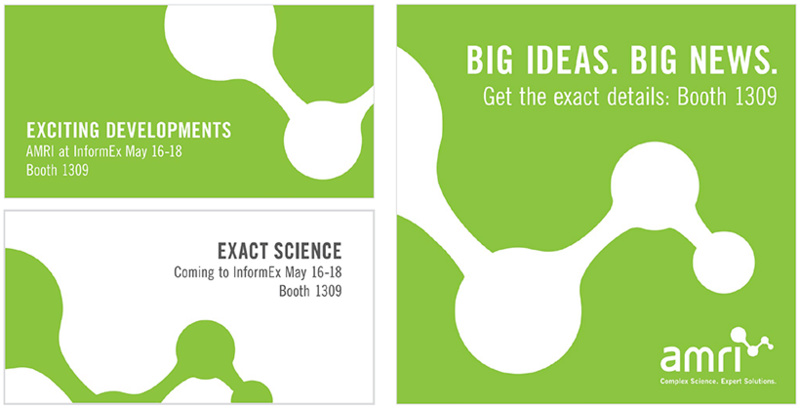 With its bold signage and a significant thought leader presence, the brand launch event at InformEx/CPhI North America created positive buzz on the show floor. Mini humidifier giveaways were popular with attendees, and all collateral reflected the brand’s new look and updated messaging. 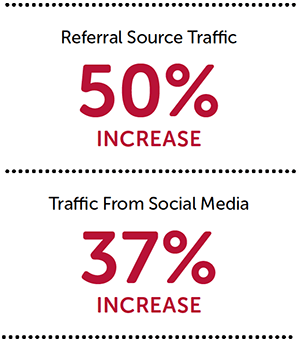 Comparing performance in the quarter before the brand launch to the quarter after, AMRI experienced significant traffic increases across all channels. 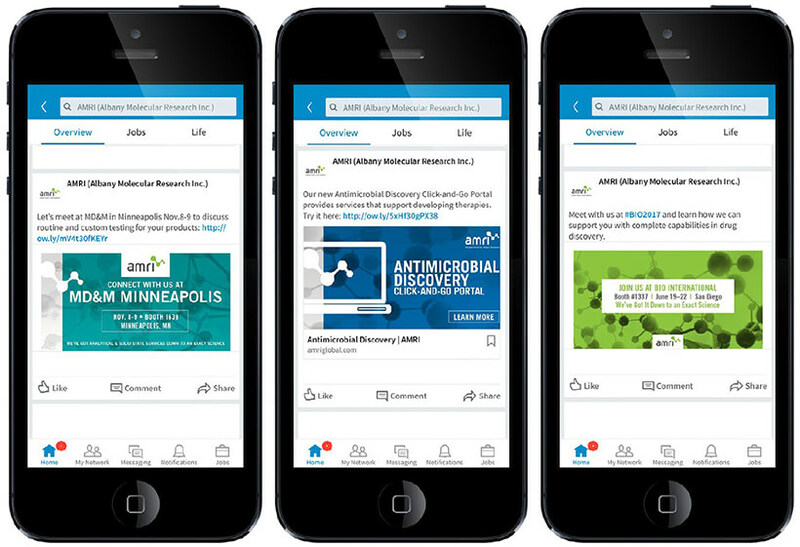 The SCORR team created social media posts promoting trade show attendance as well as AMRI’s rebrand, education materials, news and events, with a focus on AMRI’s complete suite of capabilities and thought leader presentations and publications. These high-performing posts drove increased website traffic, with a 176 percent increase in web traffic from social media from Q1 to Q2. By improving AMRI’s list segmentation and creating more engaging subject lines and content, SCORR’s email marketing significantly increased website traffic. In Q2 of 2017, there was a 342 percent increase in traffic to the website from email. developed a media plan and negotiated placement in a multichannel mix of print and digital publications. 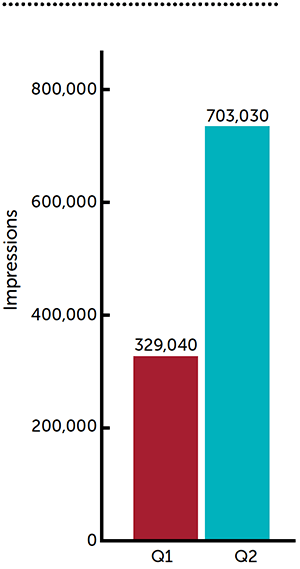 The majority of media placements exceeded industry averages for click-thru rates (CTRs). The top-performing interstitial ad showed a 5.49 percent CTR, which is more than three times higher than the rates typically seen in the industry. 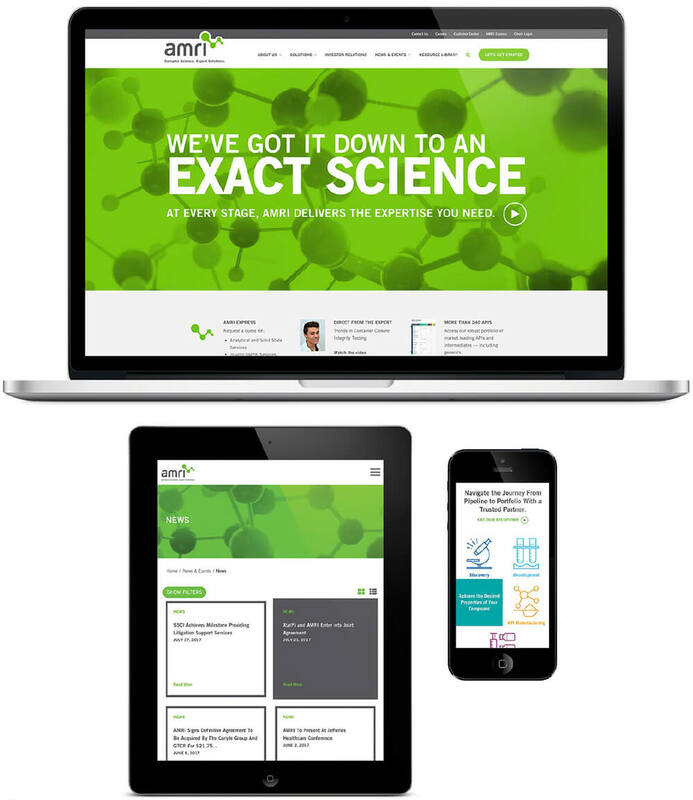 From building a strategic brand from the ground up to a full launch at InformEx/CPhI North America, SCORR designed and delivered an integrated marketing campaign that exceeded AMRI’s objectives. acquisitions into its primary brand. AMRI’s new brand differentiated the company in the crowded marketplace. After helping AMRI to successfully integrate its disparate businesses under one brand focused on its scientific expertise, SCORR continues to work with AMRI as its agency of record. Share: Successfully Establishing A Single Unified Brand Following Seven Global Acquisitions.